I recently got NanoDLP working on my LittleRP2 Extended with the help of Brad. 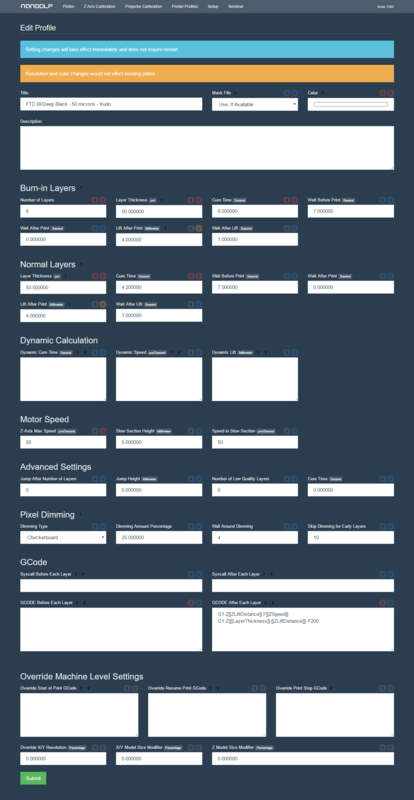 Here are some screenshots of the settings I am currently using. For some reason on my Raspberry Pi 3 I have to unplug/plug in the LittleRP2 via USB, then refresh the setup screen for it to connect via Ramps. I am not sure what is going on there, but it happened on both a Raspberry Pi 2 and 3. Also, when you connect the default Z-Axis buttons don't play very nice with the RP2 (due to NanoDLP using pulses). So you might want to add a few buttons on that screen to control. These settings helped connect me to the RAMPS board on my littleRP but I haven't managed to properly control a print. The projector turns on and off accordingly, but the platform doesn't move. Any idea what I might be doing wrong? I've got a different build of NanoDLP running on my Raspberry Pi 3, so some of the settings options are a little different. On the setup screen the commands for the projector are not fully visible. Could anyone post the comple command codes?